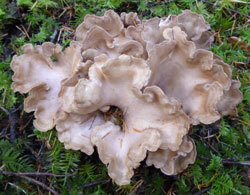 Only a few chanterelles have greeted us over the last couple of days as we prowled the forest lands in the refuge. We encountered a handful of golden and white chanterelles along with a lovely cluster of the tan and lavender colored pigs' ears, see photograph below. 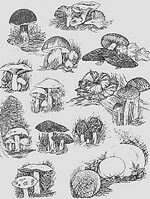 We also noticed a wide assortment of non-choice and/or non-desirable mushrooms, predominately russula and amanita. Hearty pigs' ears are particularly nice in beef dishes. One of the most astonishing discoveries we ever made while mushrooming was this polypore - what can I call it? Condominium? - on a tall Western Red Cedar snag on Mt. Hood several years ago. Even though we showed the photos to several very knowledgeable mycologists, we were never able to identify it precisely, but this never bothered us much. The fact was that it was by far the most impressive polypore - what? Colonization? - we ever saw and ever expect to see. 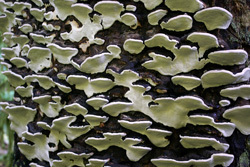 The fact that I am at a loss for words to describe this incredible fungus (a rare occurrence for me!) is a measure of how impressive it was. But I somehow found words not long after we discovered it on the west (wet) side of Mt. Hood in 2007. Our conk condo as we discovered it in 2007. Mary and I have produced our own Christmas cards for many years. They always consist of a photo I've taken, together with a rhyme (some of our friends call them poems, but they are always couplets, the only type of poetry I seem able to produce). The rhymes attempt to tie the photo to the holidays in some way, sometimes more successfully than others. Our cards have had a wide variety of subjects, including blacktail deer, Icelandic icebergs, a chipmunk eating a peanut offered him by a Santa impersonator (me), a red-shafted flicker picking overripe elderberries, a huge flock of Kenyan flamingoes, a lovely little water ouzel, some very handsome darlingtonias, a praying mantis, crab boats from Port Orford and one of Mt. Hood itself, complete with triple cloud cap. 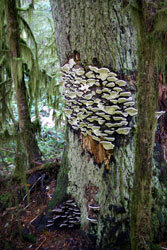 In 2007, the polypore condo simply had to be the subject, and here is the photo, followed by the rhyme. The photograph that accompanied our Christmas card. Sometimes when you're leafing through a magazine a recipe will simply jump off the page. That's what happened the other day when I was looking through the August/September 2010 issue of "Taste of Home" and came across Barbara Estabrooks' Cheese, Wild Mushroom 'n Bacon Pie recipe which was the Philly Cream Cheese grand prize winner. And, deservedly so. It's a silky, savory update to the traditional quiche, thanks in large part to the inclusion of our seasonal wild mushrooms. We folded rehydrated Birch Boletes along with fresh chanterelles (which we gathered earlier in the day on our refuge) into the dish and served it as an appetizer to very appreciative guests! 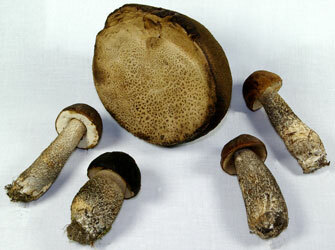 We used the remainder of our dehydrated Birch Boletes in our pie.